List a short summary of the main Expedition objectives. - Balkonhoehle: Connections to other parts of the SMK have been found in deep Balkonhoehle as well as other promising leads. - Fischgesicht: Many promising leads and a possibility of connecting to "Happy Butterfly" found previously. At end of last expo, large phreatic tunnel found with strong draught leading in direction of rest of SMK found. We intend to establish a second surface camp at "Garlic Cave" to provide a base for further exploration of Homecoming Hole and continued surface prospecting. A major focus of the expedition is training and inspiring student cavers in expedition caving techniques. This has a major effect on ensuring future generations maintain and continue the efforts of expeditionary projects and speleological discoveries. Please explain the aspects of the trip which make it eligible for Ghar Parau funding. Funding from the GPF has hugely benefited the previous expeditions to the Loser which, in turn, have accomplished much in discovery and survey of new caves as well as training and inspiring many new expedition-goers. Whilst at its core the expedition remains a CUCC student-led endeavour, it has rapidly, in the past few years, benefited from the collaboration of many individuals from other student caving clubs. GPF funding has made such student involvement possible by providing resources and equipment that would not otherwise be available. This year, the plan is to maintain the intensity of the expedition with a relatively large contingent (distributed across different times, with well over half university students and younger members), an ambitious size that reflects both the great popularity of the prospect for students and the scale of discovery potential in the area. Give a more detailed account of the purpose of the trip, including any particular known caves you intend to visit, specific areas where you will explore for new cave, and scientific experiments you will attempt. Last year, 5.2km of new cave was discovered, including new connections with Tunnocksgeschacht, close to the level of Camp Kraken at Anthemusa and also at Champagne on Ice in mid-level Tunnocks'. Significant discoveries include the Mongol rally - a 200m pitch - and the huge, horizontal phreas of Grand Prix. This year's efforts will focus on exploring further leads around this area with the aim of extending the SMK even further along the ridge. 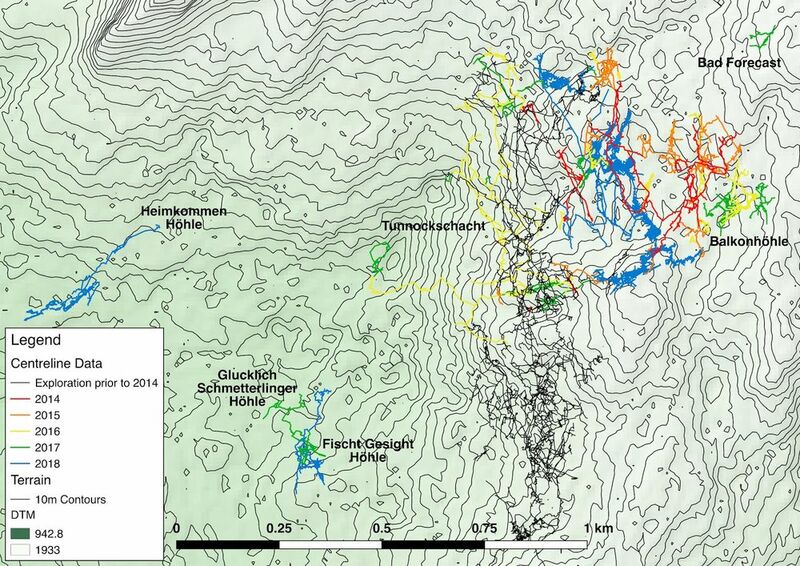 Very impressive phreatic developments were found in Fischgesicht last year, particularly a large development tending northeast towards the main Schwarzmooskogel system that could be potentially significant as a route to connect in. This will be one of the primary focuses of the expedition in 2019. This cave showed promising leads last year and, this year, there is an intention to complete its exploration or to find possible connections leading back towards the rest of the SMK. To do this (and to alleviate strain on the main camp at Steinbrucken) a secondary camp will be established at "Garlic Cave," which is much closer to Heimkommen, Kein Wassermelon, Fischgesicht, and Glucklich Schmetterling. Additionally, we will continue our observation of the effects of climate change on the ice and snow levels on the plateau.This will be recorded photographically, as well as through the use of devices such as fixed rulers to allow quantitative measurement of the levels of "permanent ice". Rigorous survey and recording of the caves has remained a priority with all findings being made publicly available. Training new expedition-goers also forms a key objective in securing the future of this expedition and others across the world; an emphasis on involvement and training of university students is fundamental to the expedition. This year half of the cavers will be university students and over two thirds are younger than or will be under twenty-five. For many members, this will be their first or second expedition. Of those, many have been initiated to expedition caving on the Loser on the CUCC Expedition. Give details of any previous work in this area by your own and other teams. Include references to reports and articles published on the area, and the names of any local cavers or academics with whom you have discussed the Expedition. The CUCC expedition to Austria was established in 1976, and this represents the 43rd expedition made since then. The continual increase each year in the scope and achievements of the expeditions is testimony to this extraordinary area’s potential for the discovery of new caves. As described above, one of our aims as a student-led expedition has also been building for the long-term future of this and other expeditions by continually encouraging and training new expedition-goers. The success of this can be seen in both the number of student cavers planning to attend this year and the number of ex-student cavers who have gone on to be vital to the expedition’s continuation. We have also greatly benefited from the enthusiasm and support of Robert Seebacher, a prolific local caver and manager of the VHO. Last year, with a strong group of cavers, over 6km was surveyed, more than 5km of which SMK system, placing it in the top 10 longest caves in the world (and fourth in Europe). We are very optimistic this year that we will continue this success. A new cave, Heimkommenhoehle ("Homecoming Hole"), was discovered last year after a surface prospecting effort early in the expedition. This quickly grew to a maximum depth of over 200m and a length of over 1.6km with leads awaiting exploration this coming year. Following the expedition last year, presentations were made at Hidden Earth at Eurospeleo in Austria, where we introduced cavers from across Europe to the Loser caves. Most of the people and equipment will be driven in personal cars and vans to and from the UK to the Loser Plateau (necessitating the cost of ferry-crossings or via the channel tunnel also). A few people will be travelling from elsewhere in Europe (Norway and Poland) using their own or public transport. In-country transport will be via the aforementioned personal cars or vans. Please note that communal costs on the expedition are worked out on a per-person-per-day split rather than a per-person cost for the whole expedition, since the majority of people do not attend for the entire length of the expedition. Total costs from UK: £5,400 35 in cars and vans from the uk, assuming 2.5 people average per vehicle and carrying communal gear (estimated costs of fuel and ferry/tunnel for people leaving across England). 4 people flying and using public transport or rented cars to Bad Aussee. Total costs from outside UK: £450 One member from Copenhagen, one from Poland, one from Norway. Each travelling independently by public transport. Special 2 p.p. : £51 CaveLink System. 2 CaveLink units at £973.51 (€1100) each, plus a GSM module and Peli cases. We have proposed purchasing this spread over two years; if we are successful then this would significantly help our budget. The expedition often receives sponsorship or discounts from food and equipment manufacturers, which will hopefully reduce the overall costs. Please give the names, addresses and phone numbers of two suitably qualified people whom the Committee can contact. You should ensure that they are aware of the objectives of your trip, and that you have their permission for the Committee to contact them. Reason: Rebecca Lawson is a hugely active and well-respected expedition-goer from the uk and has taken part in cave exploration expeditions across the world. A long history with CUCC has provided many years of familiarity with the Loser Plateau and SMK cave system. Reason: Wookey has made many innovations in cave surveying and is a highly noted and well-respected expedition caver with experience from across the world and over forty years of expeditionary caving adventures.